A four-day salsa extravaganza held in the Marriott Hotel in downtown Oakland. The SF Salsa Congress features four days of workshops, performances, competitions, live music, and more, with dancing until 4am in the morning every night. This year is the 14-year anniversary of the SF Salsa Congress, and the event will likely be the largest ever, with an expected attendance of thousands of dancers from around the world. The Congress will feature live music from top salsa musicians including Fruko y Sus Tesos as well as performances and workshops by top dancers including Griselle Ponce and Yamulee! This is one salsa event that is not to be missed! The SF Salsa Congress is hands-down the biggest salsa event of the year. Every year the Congress draws thousands of dancers from all over the world for 4 days of non-stop salsa dancing. Whether you're a beginner or a seasoned pro, this is one event you don't want to miss. The Congress begins on Thursday night at the Oakland Marriott Hotel, which is packed to the brim with salsa dancers. There are several salsa shows throughout the night by international performers, which gives you a taste of what's to come. On Friday, the Congress kicks off in earnest, with workshops throughout the day by professional dance instructors, performances in the evening, and dancing until 4am in the morning (then the afterparties begin). This is a pattern that continues for the rest of the Congress. Saturday is Gala Night, where everyone dresses to impress, and the top dancers get on stage and wow the crowd. Then there is social dancing to the music of top salsa bands from around the world. Sunday is one of my favorite days, with the famous "Jack & Jill" competition that pairs professional instructors together at random and has them face off in an impromptu dance competition. This is one of the highlights of the Congress. Sunday evening features the World Salsa Challenge, which is a world-class salsa competition where the best dancers in the world compete for the title of Salsa World Champion. 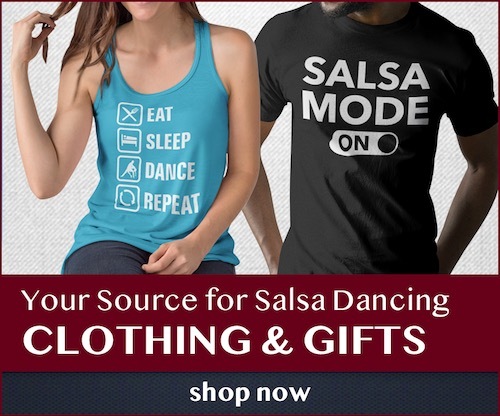 The San Francisco Salsa Congress is my favorite of event of the year, and really, if 4-nights of non-stop salsa dancing and partying don't seem fun to you, then you're probably on the wrong website! Check it out! Bare female glutes may have been a Southern California tradition, thanks to Hollywood and MTV. Hence nearly all of the LA style salsa teams, including our Bay Area local troupes, dress the women in minimal fabric that barely covers their rear ends. Moreover, most of the choreography, including men lifting women high in the air, flipping them upside down, and spinning them at 1,000 rpm, seems to be designed solely to displace the aforementioned fabric, so that the audience can have unobstructed views of the women’s glutes. After hours of glutes viewing, I hardly remember the names of the performance teams. It probably doesn’t matter, as they are almost carbon copies of one another. Alas, may I please at least see some male glutes, just for a change? What happened to our cherished gender equality? In contrast, performers from NYC have much tamer outfits as well as more sophisticated, elegant routines. Sekou McMiller and his company put up spectacular performances, and accomplished such – guess what – without baring anybody’s glutes. I hate to say that some Bay Area instructors totally ruined NY style salsa for me – and for many newer salsa students. I don’t see much difference no matter what style they claim to be doing, whether they do it on 1 or on 2 (granted, any pattern can be done both on 1 and on 2, but that’s beside the point). They should perhaps be more aptly categorized as “on steroids.” It might be alright for the men to lift the women on stage, as those women weigh no more than 70 pounds. Off the stage, however, if you see that as the standard, and try to aspire to that standard by lifting me up on the dance floor, you might seriously injure yourself and end up going to your chiropractor for years. I’ve only seen bachata and salsa rooms. And every now and then a kizomba song in the bachata room, which is kind of useless because after one song you’ve barely built the connection with your partner in kizomba, if you even managed to find a partner in time before the next bachata starts. Most of the shows were okay, but I really prefer the partner shows, with just one couple performing instead of a group (or even a solo dance, I’ve never seen that before at a salsa congress). Those are usually also the best and the most impressive, but unfortunately they were a minority now (on European congresses there are more of those, percentage wise, though I have to admit I only saw the late shows on each day). I read a comment above about the clothing, but I didn’t think it was much different from what I see at other places. Anyway, when it comes to general dancing a lot of European congresses (where I’m from) are better, and a whole less pricy too, like half the price if you just want to go for the general dancing. Please try to keep up!